I meant to do this entry last Monday but I did not have time to actually sit down to write it but here it is now. I read this book end of last year and feel in love with the whole story. Sure it's a romance story but it's all about the human spirit. I was so excited to see this movie and I honestly was not disappointed by it. Of course the book is better and I recommend reading this book if you haven't! The wardrobe designer, Jacqueline West, and art director did a great job recreating the 1930s and showing the difference between the different tiers in the circus simply through clothes. 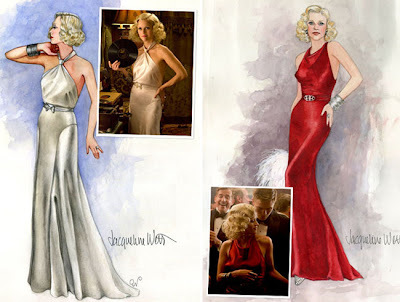 Reese Witherspoon's character Marlena has the most amazing clothing from beautiful elegant dresses to her on stage costumes that glitter and glow. It's amazing how the style in the movie can easily transcend to today's style. Elegant maxi dresses that are seen down the runways today of such designers Lanvin. There was also a scene where Marlena was dressed a bit down which could look like riding gear with a simple basic top, brown shorts, a head band and an arm full of bangles. For some reason the arm full of bangles stood out to me. Maybe it was because the outfit was so basic that this was easy to catch or maybe it was just that it was so relate able. That we all throw on accessories over an easy outfit. When I was kid I use to go to the circus every year with my parents. It was really something I enjoyed and so did my dad. I'll never forget when I told my dad I didn't want to go to the circus anymore I broke his heart but I was to much of an agnsty teenager to care. I miss going to the circus with my dad, this is one of those times where I feel bad for growing up. Anyway, I remember every time I left I left with a cup, some kind of glow stick, and a stuff animal. I remember loving the elephants and always wanting to ride one. Reese Witherspoon def. stole my dream and I'm sure a lot of other girls dreams too. It really must have been an amazing experience. Elephants are such interesting animals, they are so smart and have a real sense of feelings and emotions. Just like the circus this story and movie is so whimsical. It's a tear jerker but the whole world in which this story lives in is so different. The movie was such a feast for the eyes! I love seeing some of the looks here. How about her sparkly show costumes? That is one look I wish I could pull off!